The bar and restaurant facilities on Las Terrazas de La Torre Golf Resort are limited, due to the low year round occupancy levels. 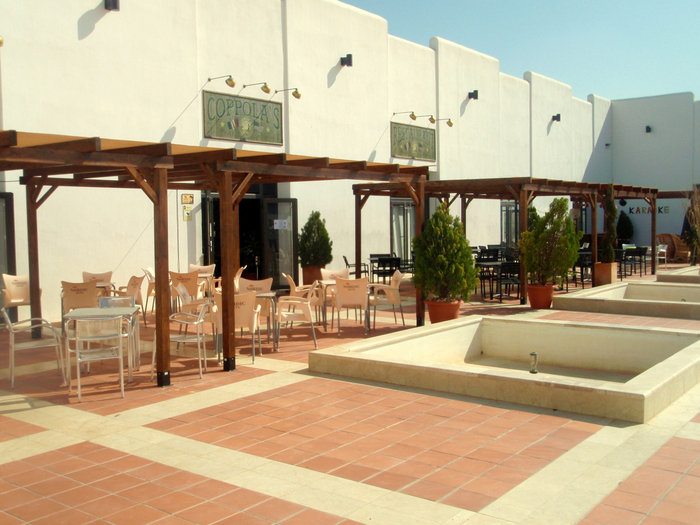 There is one restaurant at the “town centre” serving varied international cuisine: this is open every day from mid-morning onwards, and both indoor and outdoor dining areas are available, with terraces either side of the restaurant itself.Apart from the restaurant, the only other option onsite is the small cafeteria at the golf clubhouse, just the other side of the road from the restaurant. If you prefer to venture out of the development for a meal, there is plenty on offer only a short distance away. Roldán has a few restaurants: an Indian, various Italians, various Spanish bars and restaurants, Chinese food, and a fair few establishments clearly designed to attract the non-Spaniards using La Torre, Las Terrazas and other nearby developments. On the nearby industrial estate on the Murcia-San Javier road there is another Indian and a Spanish tandoori restaurant owned. The setting of an industrial estate sounds unappetizing, but don’t be put off! The towns of Torre Pacheco and Los Alcázares are within 15 minutes’ drive, and both offer a wide range of dining experiences, from a plethora of typically Spanish eateries to an impressive list of international cuisine. Slightly further afield, Las Terrazas de la Torre Golf Resort is no more than 30 minutes from Cartagena and 35 minutes from Murcia, bringing both of the Region’s major cities within easy range for a special meal out. The southern end of the Costa Blanca is also close by (Pilar de la Horadada 15 minutes, Torrevieja 30 minutes), as is La Manga (30 minutes), so there’s no excuse for failing to combine a little sightseeing with broadening your gastronomic horizons.